The term typically refers to the grooves running vertically on a column shaft or a pilaster, but need not necessarily be restricted to those two applications. If the hollowing out of material meets in a point, the point is called an arris. Fluting promotes a play of light on a column which helps the column appear more perfectly round than a smooth column. As a strong vertical element it also has the visual effect of minimizing any horizontal joints. Greek architects viewed rhythm as an important design element. As such, fluting was often used on buildings and temples to increase the sense of rhythm. It may also be incorporated in columns to make them look thinner, lighter, and more elegant. There is debate as to whether fluting was originally used in imitation of ancient woodworking practices, mimicking adze marks on wooden columns made from tree trunks, or whether it was designed to imitate plant forms. Either way, it was not invented by the Greeks who popularized it, but rather learned from the Mycenaeans or the Egyptians. 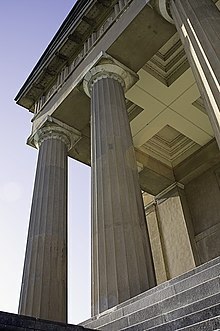 Fluted columns styled under the Doric order of architecture have 20 flutes. Ionic, Corinthian, and Composite columns traditionally have 24. Fluting is never used on Tuscan order columns. Fluting is always applied exclusively to the shaft of the column, and may run either the entire shaft length from the base to the capital, or only on the upper two thirds of the column shaft. The latter application is used to compliment the entasis of the column, which begins one third of the way up from the bottom of the shaft. Fluting might be applied to freestanding, structural columns, as well as engaged columns and decorative pilasters. While Greek temples employed columns for load-bearing purposes, Roman architects used columns more often as decorative elements. 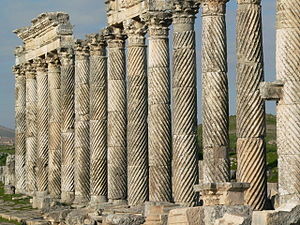 Fluting was used in both Greek and Roman architecture. Persian style columns do not follow the Classical orders, but were developed during the Achaemenid Empire in ancient Persia. These columns are usually characterized as fluted columns with long capitals featuring two highly decorated animals. Examples can be most clearly seen in the ruins of Persepolis, Iran. One of the earliest remaining examples of fluting in columns can be seen at Djoser's necropolis in Saqqara, built by Imhotep in the 27th century BC. These columns are made of limestone and used fluting with the intention of looking like bundles of plant stems. Renaissance Architecture, built between the 14th and 17th centuries in Europe, centered on a revival of classical architectural elements, including Classical order columns. The Neoclassical is a Classical revival beginning in the 18th century and continuing today. This style is exemplified throughout many government buildings and monuments in the United States, as it was popular during the American Revolution. ^ Jones, Mark Wilson. Origins of Classical Architecture: Temples, Orders and Gifts to the Gods in Ancient Greece. Yale University Press, 2014. ^ Carr, K.E. What is a fluted column?. Quatr.us Study Guides, July 1, 2017. Web. November 21, 2018. ^ “Fluting and Reeding.” Encyclopaedia Britannica, Encyclopaedia Britannica, Inc., 2018, www.britannica.com/technology/fluting-and-reeding. ^ Jutras, Joseph. “Using the Orders.” Institute of Traditional Architecture, 2 Jan. 2015, www.institute-of-traditional-architecture.org/using-the-orders/. ^ "Fluting." Dictionary of Architecture & Landscape Architecture. John Fleming, Hugh Honour, and Nikolaus Pevsner. 5th ed. (London: Penguin, 1999). ^ Winter, Frederick E. Studies in Hellenistic Architecture. University of Toronto Press, 2006. ^ “Architectural Styles and Language.” Roman Architecture: An Expert Visual Guide to the Glorious Classical Heritage of Ancient Rome, by Nigel Rodgers, Southwater, 2006, pp. 38–39. This page was last edited on 11 March 2019, at 13:58 (UTC).